Our solutions extend and enhance the capabilities of the experienced growing staff and make labor more efficient. - Plant images and data, any time, any where, on your phone, tablet, or computer. - Computer vision ‘face’ recognition of individual plants enabling automated tracking of inventory movement. - Inventory counts and space utilization measurements, recorded automatically. - Digital Flagging labor management system allows a grower to extend the current method of placing physical flags to assign work tasks to digital versions of the same flags. Luna is the first computer vision platform designed to work hand-in-hand with growers, empowering them to see and control more. It offers plant-level data analysis combining sensors with its revolutionary greenhouse rail track network coupled with high-definition imagining. The result? Growers can identify potential problems proactively through real-time visibility and insights, improving response rates, increasing labor efficiency, reducing scrap and dump, optimizing supply chain management and dramatically impacting outcomes. It’s designed to integrate seamlessly with your growing team, improving business outcomes and customer satisfaction. Luna delivers a platform that proactively tracks and traces your crops ensuring you can meet and maintain the highest standards. If plants deviate from these stringent standards, the team is alerted for an immediate intervention. Readiness indicators highlight when crops are ideal for shipping, equaling better in-store performance and sell-through – you plant less and grow more efficiently. Luna detects growth anomalies as soon as they start. It does this by comparing the current crops to model crops and displaying associated growth curves, enabling the team to make quick decisions and assign members specific tasks in targeted locations. Luna’s analytics reliably predict when plants will be ready for harvest while providing timely feedback on the efficacy of treatments and recipes over the entire growth cycle. 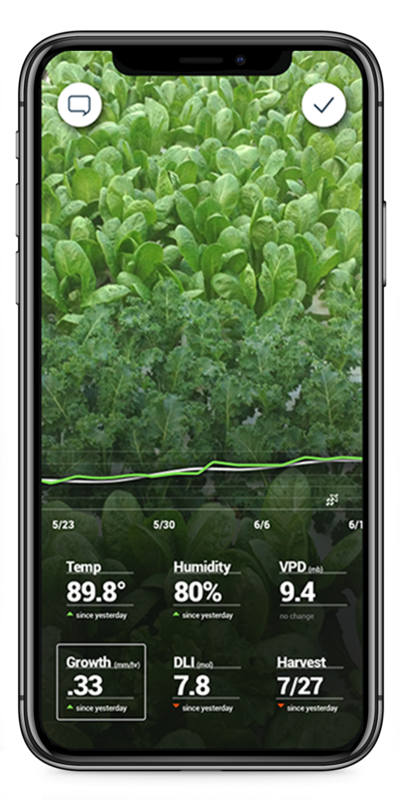 Luna allows end-to-end tracking and measurement for your indoor growing operation – giving you comparative analysis between forecasted and actual results. It also eliminates extraneous data collection and team time wasted on unnecessary tasks outside of what delivers top-notch outcomes. With Luna, you can track assignments, manage plans and implement repeatable solutions to common problems without reinventing the wheel or reassigning roles and responsibilities. Luna automates repetitive tasks and facilitates process improvements by identifying bottlenecks. The elimination of redundant steps in the growing process allows workers to be more efficient and focused, getting you a better result. The platform’s real-time, comprehensive supply chain management tools give a grower true risk management insight and the ability for early detection and proactive intervention. Greenhouse operations are constantly changing based on new methods, regulations or simply because of business needs. Luna gives you the flexibility to adapt and alter your processes quickly and efficiently while also considering cost impact. Save time and energy walking back and forth surveying your facility. Luna will capture.your plants and let you know where they've been moved.